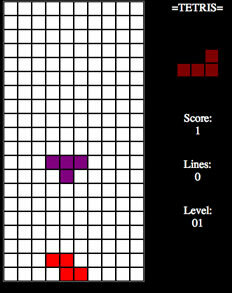 Other than that, well, it's Tetris. It's nice but it's been done in 512bytes in JS before. scoring 351 lines at lvl 18 (35987 Points) and I noticed NO significant increase of difficulty.....the pieces didn`t move any faster in level 18 as they do in level 1....so it got boring...still a nice effort, tweak the "balancing" and you will get my thump up. page created in 0.013190 seconds with 15 queries.